On the day before the election for the office of the President of the United States of America, Sen. Barack Obama (D-Ill.) and Sen. John McCain (R-Ariz.) wrote “end of the campaign” opinion pieces in The Wall Street Journal. Mr. Obama’s article was on the left side of the page. Mr. McCain’s article was on the right side of the page. It was a kind of contest as to who could promise the most to the voters. why the United States economy is in the beginning of a long recession and perhaps at the beginning of a real depression. The voters are likely to get exactly what they deserve. 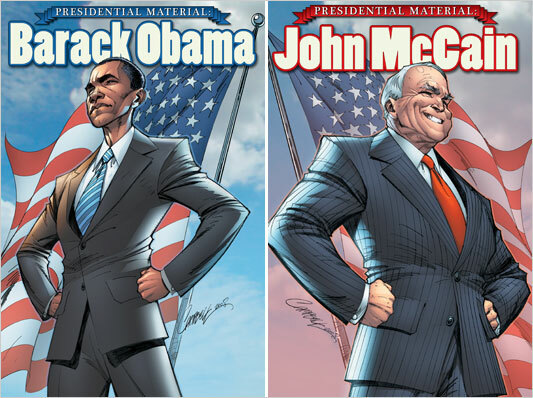 Comic book art of Mr. Obama and Mr. McCain standing are from “Presidential Materials” biographical comics published by IDW Publishing and drawn by American comic book artist J. Scott Campbell, aka Jeff Scott. 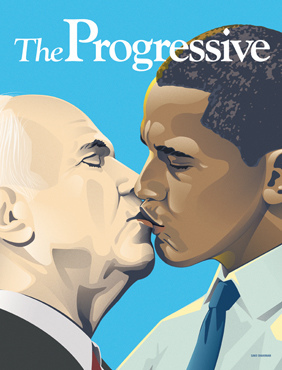 Los Angeles based graphic designer Sako Shaninian painted the image of Mr. McCain and Mr. Obama kissing.